At the ripe old age of ten, the current incarnation of the Napster music service scarcely resembles its former bawdy self. If the original Napster was a loud, raucous garage band made up of drunken college students, the present offering is what happens when the band sobers up, signs to a major label, and starts house hunting. Long gone are the days of free-flowing music from the vine of central servers. Today’s Napster requires a grown-up kind of commitment: a credit card and a monthly subscription. It also faces stiff competition; while Napster morphed from its lawless larval stage to a dues-paying music service, consumers in search of free content have had their pick of surviving peer-to-peer applications and torrent sites that more than make up for the loss of the original rogue site. For today’s Napster, that means that along with the unlimited streaming capability that a monthly $5.00 subscription fee buys, the listener also scores five “free” digital downloads with no strings attached. For some artists, Anderson’s scenario translates into giving away the entire album for free in hopes that fans will pay for concert tickets or limited access to live streaming video from the road. What’s clear at this point in the evolution of the music business is that there is no clear business model. 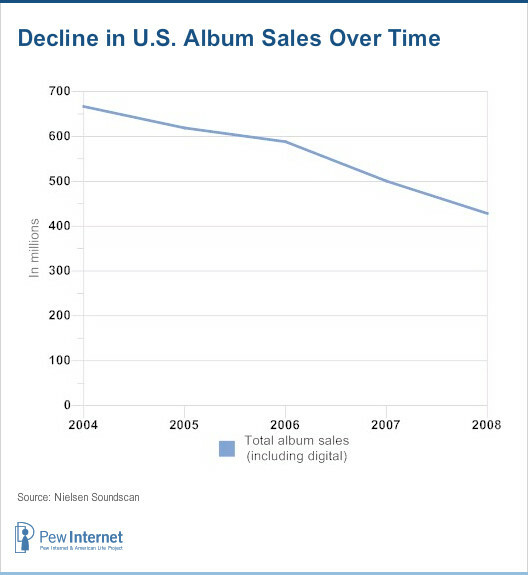 In the internet age, selling recorded music has become as much of an art as making the music itself. While the music industry has been on the front lines of the battle to convert freeloaders into paying customers, their efforts have been watched closely by other digitized industries—newspapers, book publishing and Hollywood among them—who are hoping to staunch their own bleeding before it’s too late. And if the music market is any indication of how consumer expectations will evolve elsewhere, the demands for free content will extend far beyond the mere cost of the product. All of this makes for a tall order, but if history is any guide, music consumers usually get what they want. As researchers look back on the first decade of the 21st Century, many will no doubt point to the formative impact of file-sharing and peer-to-peer exchange of music on the internet. Distributed networks of socially-driven music sharing helped lay the foundation for mainstream engagement with participatory media applications. Napster and other peer-to-peer services “schooled” users in the social practice of downloading, uploading, and sharing digital content, which, in turn, has contributed to increased demand for broadband, greater processing power, and mobile media devices. Media analysts now broadly use the term, “Napsterization” to refer to a massive shift in a given industry where networked consumers armed with technology and high-speed connectivity disrupt traditional institutions, hierarchies and distribution systems. And in many cases, those consumers have come to expect that a digitized version of a product—such as news, movies or television shows—should be available online for free. Yet, the current reach of this Napsterization effect extends far beyond the media industry; patients are sharing peer-to-peer expertise on coping with medical conditions and are engaged in efforts to gain free access to vaulted personal health records, citizens are networking to increase oversight of politicians and are demanding unfettered access to government data. Even online daters—one of the few segments of the internet universe willing to pay at the gates of the walled garden—are circumventing the paid services and connecting directly via free social networking sites. Music critic Sasha Frere-Jones has referred to the plight of the music industry as the “canary in the economic coal mine,” citing it as “a small example of the enormous financial buckling that is now global.”24 If the music business was the canary, then the MP3 was its carbon monoxide, choking an industry that had built its empire on the clean, regulated air of analog music products. First, music went digital. Then the MP3 compression format shrunk those big music files into transportable size. After that, there was little hope of record companies making it out of the mine without some serious lung damage. Napster arrived at a time when tightly controlled access to new music was still the norm. While online radio stations were starting to flourish, music lovers were becoming disillusioned with the homogenizing effects of terrestrial radio consolidation that was enabled by the 1996 Telecommunications Act. Their frustrations were made clear when the Federal Communications Commission reviewed these rules in 2003 and opened them up for public comment. The FCC received more than 15,000 letters, emails and other documents. This was one of the largest responses in FCC history, with most writing in to oppose further media consolidation.25 Before Napster, internet users had limited access to digital music through legitimate channels. After Napster’s software allowed fans to share their entire catalog of music files online, the music ecology radically changed. And among that 13% of music consumers who do pay for downloads, there’s no doubt that the eight-year-old iTunes service continues to dominate the market. Yet, as robust as the iTunes catalog may be, there are still surprising holes in the store’s offerings. Popular artists such as AC/DC still do not have licensing deals with Apple, and many older albums from independent artists like Silver Sun have never made it to iTunes’ digital shelves. Music fans in search of these recordings are still more likely to find them on peer-to-peer networks, torrent trackers, and eBay. The industry met the outcries from music-sharing fans by arguing the morality of its case: Taking CDs from a record store was wrong, why should taking digital music online be any different? However, when artists spoke on the industry’s behalf, they didn’t always present a unified message that sharing music in any context without permission was wrong. While Metallica became the iconic anti-file-sharing band, there were many other artists who weren’t so quick to decry the networks and the openness of the MP3 format. Artists’ varied views on the impact of file sharing were also documented in Pew Internet’s “Artists, Musicians and the Internet” report from 2004.41 While most artists we interviewed believed that unauthorized online file sharing was wrong, few felt the industry was in peril because of the networks. When asked about the threat peer-to-peer file-sharing posed to creative industries at the time, two-thirds of artists said the activity posed only a minor threat or no threat at all to them. Further, there were some major divisions among them about what constituted appropriate copying and sharing of digital files. Yet, among those who were both successful and struggling, the artists and musicians we surveyed were more likely to say that the internet had made it possible for them to make more money from their art than they were to say it had made it harder to protect their work from piracy or unlawful use. The success of the Radiohead and Nine Inch Nails experiments would be the prologue to an industry-wide loosening of the ties around digital distribution. Shortly after the RIAA had announced the end to its litigation against individual file sharers at the end of 2008, iTunes halted the sale of music bundled with “digital rights management” protection. Digital rights management (DRM) has been defined by the Federal Trade Commission as “technologies typically used by hardware manufacturers, publishers, and copyright holders to attempt to control how consumers access and use media and entertainment content.”44 DRM has made its way into everything from cell phones to in-flight entertainment systems. Many consumers have encountered the restrictions firsthand when trying to make copies of purchased music or transfer songs to mobile devices. Apple’s iTunes music service pioneered the widespread use of DRM that came bundled with the purchase of individual digital music files online. Among the various restrictions embedded in the files were limits on the number of computers that could play the songs and the kinds of software and portable devices that could be used to listen to the music. These restrictions and assurances that the files would not be widely redistributed online were necessary for Apple to acquire the licensing they needed from the record labels to sell the music in the first place. However, after years of negotiations, the labels agreed to drop those protections in exchange for the right to variable pricing on iTunes. And now that iTunes and many other legitimate digital music offerings are DRM-free, the labels have effectively set a new industry standard in freedom and flexibility for consumers. This belated embrace of the infinitely shareable music file comes only after lots of clumsy dancing with DRM. For every new copy protection scheme that has emerged, there have been hundreds, if not thousands, of hackers waiting in the wings to expose the technology’s flaws and share their discoveries with the world. One of the most famous hacks in music DRM history involved nothing more than the use of a Magic Marker to disable the copy protection built into CDs.45 And while DRM-protected music undoubtedly became more sophisticated over the years, it remained a tough sell to consumers when unauthorized copies of songs unfettered by DRM were so widely available for free. Yet, for all the major changes in the industry’s tactics, the relaxed attitude only goes so far. Through digital fingerprinting and other tracking technologies, the record labels are monitoring copyrighted content as closely as ever and are counting on two major new strategies to help them: First, is a landmark partnership with internet service providers to monitor file sharing activity and potentially cut off service to the worst offenders. Second, is a series of partnerships with universities that would incorporate music subscription fees (predicted to be less than five dollars per student) into student tuition bills.47 If successful, a similar ISP-based fee could be implemented for the general public. The subscription model has been tossed around for more than a decade, with proponents arguing that music—and any kind of copyrighted content—gains more value as it is widely distributed.48 Blanket fees assure that artists are paid for their work, and consumers have the freedom to listen to music on any device and in any location they choose. And as music consumption becomes increasingly mobile, the labels have begun to experiment with all-you-can-eat music download plans like Nokia’s “Comes With Music” plan which is bundled with the purchase of a cell phone. At the same time, free streaming music services continue to fill an important and growing niche; Pandora and imeem have recently unveiled iPhone apps that allow users to access their accounts and listen to music on the go. Looking ahead, as users’ engagement with cloud computing activities becomes more pervasive and seamless, there may come a time when the difference between downloading and streaming music files becomes moot. 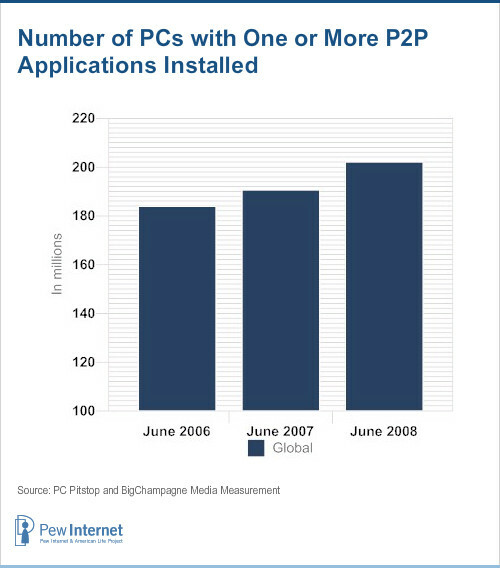 At the moment, Pew Internet Project data shows that 69% of online Americans have already taken advantage of some form of cloud computing such as using webmail services, storing data online, or using other applications whose functionality is located on the web.49 As more and more internet users acquire smart phones and high-speed wireless connectivity improves, music consumers get ever closer to the “celestial jukebox” dream of any song at any time that started during the days of Napster. For now, quality and reliability are still an issue, but the march of technology will quickly stomp out that minor hurdle. Ultimately, whether you’re storing a library of music files on your home computer or streaming songs through your iPhone, it all becomes the same: instant access to the music you want.